Toronto, November 22, 2016 –The Health Research Foundation (HRF), along with Prix Galien Canada and Research Canada is pleased to celebrate and honour the best and brightest minds of Canada’s life sciences and health research advocacy sectors, at the HRF Research Awards Gala. · Dr. Cheryl Rockman-Greenberg, awarded the HRF Medal of Honour. Dr. Rockman-Greenberg recognized the importance of molecular medicine in the 1980's and was the driving force behind the opening of the first laboratory in Manitoba for the diagnosis of genetic disease with DNA testing. She identified the molecular source of some of Canada’s most devastating inherited diseases, including those most prevalent in the Aboriginal, Mennonite and Hutterite communities, and in partnership, developed and implemented strategies for early detection and in many cases effective treatments not available previously. · Dr. Grant Pierce, awarded the Research Canada Leadership Award for Health Research Advocacy. Dr. Pierce has been an outstanding leader in advancing the case for the hope and promise of health research in advancing deeper understanding of factors leading to health and disease. · The BC Centre for Excellence in HIV/AIDS (BC-CfE), awarded the Research Canada Leadership Award for Health Research Advocacy, for its work which has been pivotal in the fight against HIV and AIDS in British Columbia, Canada and internationally. For more than two decades, the advances discovered at the BC-CfE have informed policy, service delivery, harm reduction approaches and quality of care. · Dr. Philip Halloran, awarded the Prix Galien Research Award, recognized for his continuing research which has examined multiple areas associated with organ transplantation including the identification of gene regulation in graft rejection, the description of antibody-mediated rejection as well as the impact of immunosuppressive drug treatment. 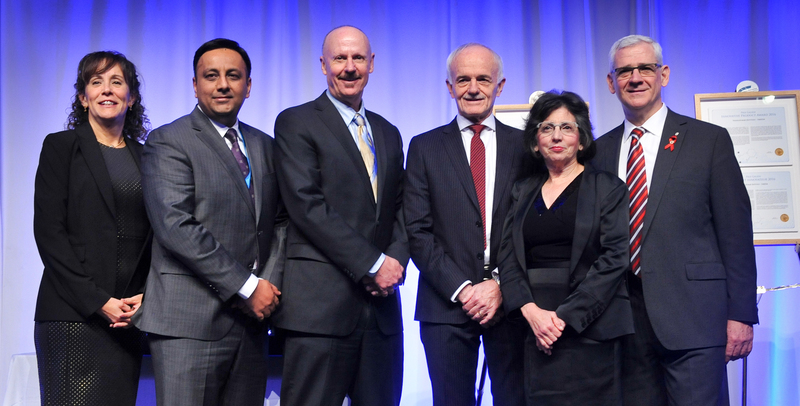 · The Prix Galien Innovative Product Award is given to Gilead Sciences Canada for Harvoni (ledipasvir and sofosbuvir) and to Takeda Canada Inc. for Entyvio (vedolizumab). This award recognizes Harvoni as it is a drug combination that has made Hepatitis C the first curable chronic viral infection and recognizes Entyvio because of its unique mechanism of action, the need for better treatment for young people with inflammatory bowel disease and the strong Canadian involvement in the discovery, development and approval of this drug. · The HRF Medal of Honour was first awarded in 1945 and recognizes remarkable individuals whose research or contributions to public policies supportive of research and development in Canada have achieved international recognition. Recipients have made pivotal contributions to the advancement of knowledge in health sciences and/or the improvement of therapeutics healthcare. · The Prix Galien Canada is the most prestigious award in the field of Canadian pharmaceutical research and innovation, recognizing the efforts and achievements of pharmaceutical research and development. · The Research Canada Leadership Award honours champions in health research advocacy and is given on an annual basis to recognize outstanding efforts in advocating for Canadian health research at the local, provincial and/or national level.